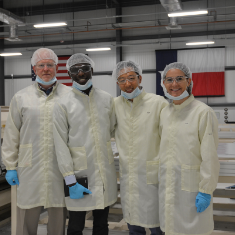 Chinedu Oputa performed an initial assessment, conceptual design and economic analysis for a renewable energy and sustainability initiative to support the Texas Army National Guard (TXARNG). The Texas Military Department (TMD), the Texas state agency charged with supporting the TXARNG, was seeking innovative solutions to increase renewable energy generation in its energy portfolio while at the same time reducing its costs for energy. However, the agency had not yet determined the best way forward to accomplish this task, which would also require an economic evaluation. Through a partnership with the Environmental Defense Fund (EDF), Climate Corps fellow Chinedu Oputa was hired to conduct a feasibility analysis for renewable energy generation opportunities that would reduce energy costs and increase the amount of renewable energy generation in the overall TMD energy portfolio. Oputa collected and analyzed energy use data from multiple TXARNG sites and engaged with relevant stakeholders. He determined that the retail electricity accounts analyzed represented 30% of TMD’s total electric use. After conducting site visits and consultations with the TMD energy and sustainability team, he identified the optimal solution for a renewable energy generation project that factored in requirements for land use, proximity to electrical distribution lines, soil type, and favorable topography. Turning his attention to the economic feasibility, Oputa researched and analyzed several contracting and procurement methods available to TMD to achieve this objective. He also assessed the impact and risks of delaying this effort to include investment tax credits (ITC) for renewable energy projects and current TMD contracts to purchase energy which are nearing the term of their agreement. This project has a net present value (NPV) of $3.3 million with the potential to increase TMD’s use of renewable energy by up to 30% of its overall energy portfolio which will allow TMD to offset or avoid up to 9,000 metric tons of carbon dioxide emissions annually by purchasing its electricity from renewable energy sources. TMD’s leadership gave the approval to progress the project and partner with the State Energy Conservation Office (SECO) to further analyze the contracting and procurement methods available and engage with the energy retail market to implement this project. This will position TMD as a leader in renewable energy and sustainability initiatives amongst other National Guard states in the country. Chinedu Oputa is a Master of Engineering in Energy Systems candidate at University of Illinois Urbana-Champaign with a focus on solar energy and energy economics. Prior to attending graduate school, he worked for 7 months as a Renewable Energy and Emerging Technology Intern for a utility company. He holds a BS in Mechanical Engineering.